I was anxiously awaiting the arrival of my room screen which I ordered from Eileen Davis-Wright thru her Etsy shop A Life In Miniatures so, in the meantime, I decided to finish up a few things for the music / bed room. 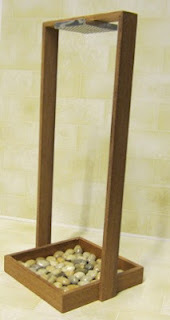 Returning to the original idea that these rooms are used for eating, sleeping and entertainment, I decided to make a Shamisen stand since I had no way of displaying the instrument unless I just propped it up against the wall which I wasn’t so keen on doing. I found more than one picture of the Koto propped up against the wall but not the shamisen. 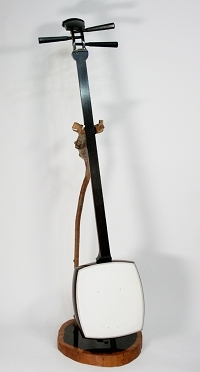 So, while researching an appropriate stand, I came across a site that sells accessories for shamisen and there was the most beautiful stand fashioned from a branch. So, that was my inspiration. I had to soak the branch to make it pliable, then I taped it over a brush handle to fix its shape. Eventually, I was able to obtain the shape I wanted and rienforced it with some glue. I cut an ice cream spoon in half and used that for the bottom of the stand. All it took was drilling a hole, inserting the branch and varnishing it up to finish it. I think it’s quite nice! And the shamisen looks great sitting in it. I also added a wall print of a woman playing a shamisen. While these pieces were drying, I worked on the shower for the spa. Also here, some research for a suitable shower and I stumbled upon a really neat solution called a Japanese rain shower. I guess it’s just a very large shower head that simulates rain so instead of a shower you are rained upon. I’d like that.... This version was too large and for that price I figured I could wing it somehow. The last thing was to tackle the folded futon and bedding. Since during the day all the bedding is folded up and put away, the perfect place was in the cubbie hole under the bookcase. I made quick work of the futon mattress using bubble wrap to bulk it up. I had purchased some double sided 1/4” tape and it was much easier than cutting my large width tape to size. I made the futon cover using some plastic wrapping (with no bubbles) and then made a few pillows. I folded over the bedding and used the tape to fix the shape then inserted everything into the space under the bookcase (which now has books since I had purchased some and they arrived in the meantime). Flat plastic wrapping for filling. The screen finally arrived (hoorah!) and I was able to add it into the Music room. I think it’s fantastic! It’s a work of art really with leaded stain glass figures of some beautiful koi fish. I actually special ordered the screen (at no extra cost) to the same scale as the house. I’m glad I did since you can see that it fits in height perfectly. At this point I can say that the screen is the most precious object right now in the house - and I hope the first of many. Beautiful koi fish - graceful addition to the music room. Detail of the stain glass screen. Completed room with dinner table set and lights dimmed.